Today is Black Friday and a lot of people are going crazy. I’ve never waited in line for a Black Friday sale and I generally do my best to avoid the mall and shopping centers the day after Thanksgiving. In America, though, Black Friday is becoming more and more culturally relevant and it’s even expanding into Thursday night. With its burgeoning popularity, I thought we’d look at five biblical characters and how and where they would have spent Black Friday. Had Pharaoh known the calamity that would befall his nation, he would have spent weeks waiting for Home Depot's Black Friday sale. Home Depot has everything an Egyptian ruler needs to build a bomb shelter and ride out plagues of darkness, hail and bloody water. Pharaoh would have looked like a genius for buying a water purification system and for getting such a good deal on it. I don't know if Pharaoh would have found any lambs at Home Depot but he could have gotten a hot dog. And, if the hot dog was a Hebrew National, that might have been enough to appease God's anger. A visit to Victoria's Secret on Black Friday might have saved Bathsheba a lot of trouble. David was drawn to Bathsheba because she was bathing naked. Perhaps, had she been bathing in lingerie or sweats with "PINK" emblazoned on the rear, David wouldn't have been nearly as interested. Bathsheba could have also hid from David inside Victoria's Secret. No dude, not even the king, wants to look like a creeper strolling through Victoria's Secret alone. The Bible says that Samson's hair was the source of his strength. Even with supernatural locks, though, Samson probably spent a lot of time at the gym. He would have gladly traded burning off Thanksgiving calories to get a good deal on creatine, protein shakes and raw eggs at GNC's Black Friday sale. I think it would have been really hard to spend time with Samson. Sure he led God's people but he was basically an ancient gym rat and the biblical character most likely to be on "Jersey Shore". It's amazing he found time to defeat the Philistines what with all the GTL he had going on. Goliath gets painted as a wicked Philistine only interested in mocking God and killing Israelites. While that's an accurate description we also never see his other side. We never see the self-conscious man embarrassed and frustrated that he can't shop off the rack. A Black Friday sale at Big and Tall would have been an answer to Goliath's heathen prayers. Imagine how excited Goliath would have been to find something his size hanging on the rack, like a Hawaiian shirt or suit of armor. Solomon wrote an entire book in the Bible about how unsatisfied he was with life. He had wealth, power and women yet he knew something was still lacking. Had Solomon been able to peruse the Sky Mall he might have found his life complete. Sky Mall is the catalogue found on planes with some of the most ridiculous and overpriced products on planet Earth. While the hole in Solomon's life could ultimately only be filled by God, a diamond encrusted nutcracker or panda skin wallet could have gone a long way in making him feel better. A lot of people are upset over how much Black Friday has grown. 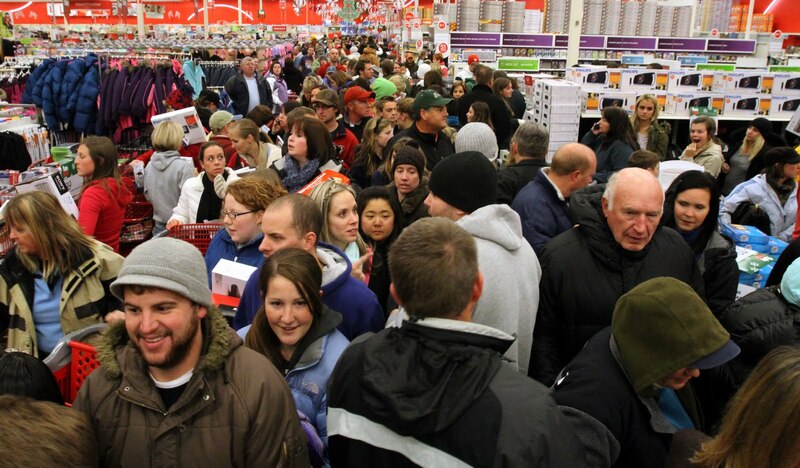 If people want to wait in line for days in order to get a good deal, more power to them. Waiting in line, though, would be far more enjoyable with a 10 foot giant or ruler of ancient Egypt. Do you go shopping on Black Friday? Why or why not? Well done. Both entertaiing and insigthful. God has given you a unique gifting Scott.